The week we spent in Mexico was amazing. After three days of traveling, the first day we were down there, we learned about a program, Familias Unidas, that helped families transition out of houses made of cheap plywood into houses made of concrete blocks. 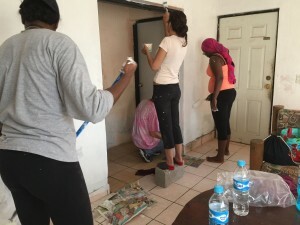 After learning about the program and how it was started, we gave service to two families that were part of the program by painting their living rooms. We spent the afternoon not only serving, but also learning about who they are and making friends. 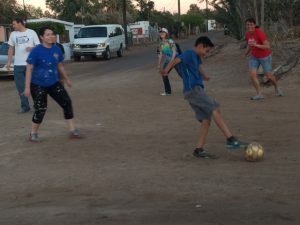 The second day, we drove to the city of Guaymas, and gave service in a a soup kitchen at Casa Franciscana. We learned about a set of programs where people learn vocations to support themselves and their future families. After that, we went to a school that’s being built, and to an after-school program called Club Jerry’s. It was a great experience having the opportunity on ASB to go and learn about all the good that is happening in other parts of the world. Each of us can do good if we just do our part wherever we may be. There’s this story about a group of men between the ages of 22 and 62. They were tasked with moving a grand piano. They spent the better part of an hour trying to account for age and strength, but not until they all just surrounded the piano and each lifted where they stood, were they able to, by some miracle, move the piano. If we each of us would do the same, imagine what we could accomplish. Getting Back from Mexico was like waking up from a wonderful dream. I was extremely sad when we left, and I just kept wishing we could go back and stay longer. It was a trip where I could forget myself and experience how other people live, their culture and what they do on a day-to-day basis. No one moment was my favorite, but I think the moment when I started realizing the great opportunity this was, was talking to Maria, the lady that hosted us in Arizona. Maria told me about her struggle to get to the States. All she wanted was to help her kids and to work hard to support them. She was willing to sacrifice everything. Later, as we journeyed deeper into Mexico, we had chances to serve. 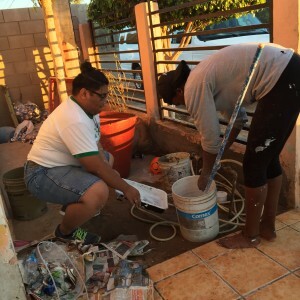 We were able to help paint houses with Familias Unidas in Kino, and then work at Casa Franciscana in Guaymas and serve food. The thing that stood out to me is how grateful the people were. They wanted so much to let us know that they appreciated us. Sometimes during the week, I would feel bad in thinking how ungrateful I was because I had so much more, and in a way my life was better. But I don’t think life is measured by material things. I was able to see how much happiness these people still had and the love for one another. They would always be smiling and laughing, and that is greater than any material thing. Even though we served others, we were also being served. I felt that every story and person I met was inspiration for me to work harder in my schooling to one day visit again and to serve others in any way possible. Lastly, I want to say that the group was great. We were able to build friendships and share an experience that will stay with us forever. I never heard any complaining and we were able to work together in whatever the task. I wish to thank all of them. This was a great experience and a wonderful opportunity. This year, I was able to participate in this wonderful 2016 ASB trip to Bahia de Kino, Sonora, Mexico. It was truly a great experience that brings me joy and great memories every time I talk about it. There are so many memories/snapshots that linger in my mind. One that I will always have in mind is painting inside the Familias Unidas homes, and we were all full of joy singing and painting and just bringing joy and smiles to other’s faces. It was truly an amazing feeling. I gained knowledge of the way people live in the Sonoran area of Mexico; what their food source is (fishing), how they live, what programs are offered for those who have no food or place to stay, etc. When we went to Guaymas, it reminded me of last year’s ASB to Mexicali, and the social issue that we discussed many times, which was immigration. When we helped serve lunch at el meson in Guaymas, it reminded me of the immigration situation. They are located in this area of Mexico, but they serve anyone who comes through and a lot of these people are migrants from South America who get on “La Bestia,” the train that people ride to try to get to the United States. It is very dangerous and many people lose their life or are seriously injured jumping on or off. Many are exploited. There were children getting lunch and asking for more because they were packing food to get ready to get on that horrible train. Also, being on the border of Naco for a day and crossing the border so easily, just reminded me of how easy it is for us citizens to cross, but for others it requires them to leave their families behind and maybe even lose their lives trying. I was raised with Mexican culture, so of course I loved and enjoyed every aspect of it. I have been to many different areas in Mexico, and every area has it’s own unique style of doing things. I definitely loved the ocean and the way it benefits everyone in the area as a food source and business. It was also sad to hear that the fishing is depleted. I felt like the greatest challenge was feeling like I wanted to do more for those that we served, but only being able to do so much. I am grateful for having enjoyed and lived such a great experience on this ASB trip. The rush of waves created by an island breeze…sand squishing between your toes… the sound of seagulls overhead… Life is a Beach. Life is more than what one makes it, because no two paths are the same. Mexico enlightened my spirit as the land unraveled my mind, and let it soar free! I was unsure of what to expect of Mexico because of the many reflections I have heard about it. My first expectations of Mexico diminished as my mind became accepting of everything that was, instead of how it was said to be. This is my reflection in regards to the experiences I shared in such a beautiful, humble environment. Mexico not only caters to its people; it also welcomes newcomers. I don’t speak Spanish nor have I been out of the country or ever experienced the ocean. All of these new things set me far outside my comfort zone. It was then that I realized how much I was missing by lingering within the confinement of my own mind. Volunteering is something I do avidly in the states. I wanted to join ASB to help serve others and to be involved in other parts of myself I have not yet unleashed. I feel as though the plethora of people, organizations, and experiences I have encountered along my path has led me to growing as person, and defining what I should be doing as opposed to what I thought I wanted. I have never felt so welcome and cared for as I did while in Mexico. The people there taught me the importance of religion and family. 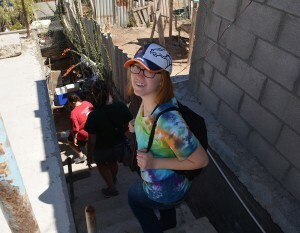 While serving at Casa Franciscana in Kino, I became a part of a community and felt the faith of all those around us. I have many mental snapshots of ASB in Mexico. Here are just a few: playing kick ball with a family in Naco; holding on to Brett for dear life in the ocean because he is a lifeguard; having a deep conversation with Vince while rolling in the waves on the water; braiding Darling and Soledad’s hair, and enjoying the company of everyone in the group when we all sat down to dinner. The snapshot that will always remind me of how important kindness is happened on Wednesday at Casa Franciscana in Guaymas. 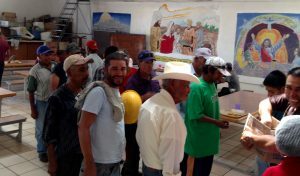 In the meson (dining hall), the ASB group and I were fed before our volunteer duties began, and as migrants and others began arriving for the noon meal. I got full from the meal of vegetable soup and crackers, and had an apple left over. I don’t like wasting food, so I offered my apple to a gentleman waiting for his meal with several others. This man and all of the others looked very tired and hungry while they watched us eat. When I gave him my apple, I thought I was being nice but this small act of kindness would teach me more about life than any other act I had ever done single handedly. I gave this man my apple in the hopes of helping one person, but instead of eating the apple himself or storing it away for later, to my astonishment he took just one bite and then passed it to the other people sitting at the table with him. This chain reaction of kindness showed me how extraordinary people are. A single person can make a difference, but when a group of people are kind to one another — that is when the world begins to change. I loved my experience with ASB and all it offered to me. Because of this experience, I have decided that I will continue volunteering locally and in other countries during the summer. Some Photos from our Experiences. Painting in the bedroom… …and the living room and kitchen! Hearing all about Familias Unidas. 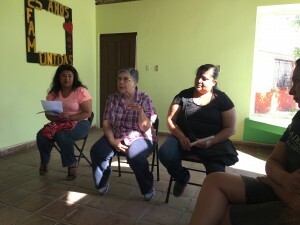 Visiting a Familias Unidas home. It has been so hard to get back into the routine of things coming back from ASB! Mexico was a great learning experience for me. I learned about many social justice issues. Of course one was the border, but there were so many more. I was very emotional throughout our journey, and at times couldn’t hold it back anymore. I saw some hard conditions, and had no idea how to react because I wanted to cry. But at the same time, I didn’t want it to seem that I thought I was better, because I am not. I met so many amazing people that are better than I could even imagine being. I remember snapshots of the trip and the many memories I made with the people there, and with the group I was with. I will forever remember Cabaña #5 at Islandia, our home for the week. Visiting the trade school that Casa Franciscana was building was another eye opening experience. There was no procrastination. The staff had a goal, and it was to make a difference for the neighborhood right away by teaching job skills. I also realized how materialistic we are in the U.S. We value our material things. While there, I began to see that people appreciate each other’s company more. They may not have much, but they have each other. I got to experience the beauty of the beach for the first time. I got my purple Mexican dress and I jumped off the pier. We had some amazing laughs as I made a fool of myself trying to be a goalie in our soccer game. But it didn’t matter because we were having fun. I loved the church in Bahia de Kino. Although they were small, you could tell they were a family, and I loved their little music group for the beautiful songs. They were amazing. While volunteering, there was not a moment that I felt like I was working, and I enjoyed every moment of it. Mexico was just great fun, great food, and great people. It was humbling and eye opening. I am so glad I was honored with the opportunity to have this experience with these people. Thank you to everyone who opened my eyes to things I never even thought of. I also want to thank everyone for making me feel welcome and immersing me in the culture. I will forever miss Bahio De Kino, Mexico. Final Reflection by Bennie Chacon. When I started this journey, I asked myself 8 questions. What will I see? I saw the joy and happiness in the faces of the 12 people I traveled with. It didn’t matter that we had been in a crowded van for 6 hrs on two-lane highway with construction. I saw the contentment in Marisa’s face when she talked about her program and the people that were helped. I also saw happiness in myself. Water is my element, so the ocean makes me happy. Being able to be with people for the length of time that I did makes me smile, since no one knew (even me) how hard that was. What will I touch? I was definitely spiritually touched. Seeing Ramon and his staff at the soup kitchen working (it was hot) really hard to make sure that the area was clean and the food was good. Most of the people there were volunteers and Ramon worked twice as much as he was getting paid for. This was amazing. What will I taste? I had the best cup of coffee at Lupita’s house. 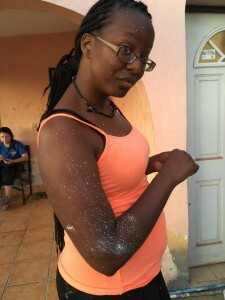 My group was painting another house and we finished before the group at Lupita’s so we went over to see if we could help. Lupita was brewing coffee and she shared a cup with me. There was definitely love in that cup. What will I hear? The sound of Maria gasping with joy at the presentation of 2 roses. She loves flowers and stated that she doesn’t get them enough. Will I thirst? This I witnessed with Frank the Franciscan who is starting a tech school. The excitement in his eyes when he talked about how he was going to fill the thirst for knowledge in his students with skills to better their lives. Will I hunger? 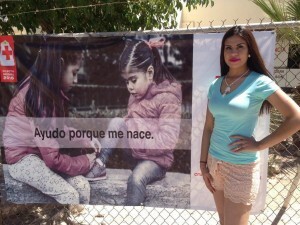 I saw the need to help in Mexico, but I also saw that I need to help my own country. I saw that my country has homelessness, hunger and the need to educate. I do hunger to help. Will there be pain? Only the music at 3am. All around me there were people with limited resources, but they seemed happy, determined to make good with what they had. So did I find Balance? Still working on it. But I did learn that being around people is not a bad thing. Helping my fellow man is not a bad thing. I am a bit closer to the Balance, but I must remember that Buddha sat under a Bodhi Tree for a time longer that I could ever dream of before he attained enlightenment. So for me, baby steps. We all made a difference! This ASB experience will be unforgettable for many of us. I am sure words cannot explain enough about the involvement, the emotions, the eye openings, the social justice issues, etc., we all had during this trip. So much can happen in just a week. We all are a group of students that have set plenty of goals during our career. I feel this experience has given us motivation to continue on our journey as a student. There was so much spirit, courage, love, team work, effort and so much more. Personally, there were many snapshots on this trip that will stay with me forever. Some were more powerful than others. 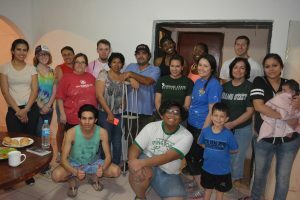 I am so grateful we were able to meet “Familias Unidas” and help paint Lupita’s and Malena’s house. I am sure they saw how influential our teamwork was. This day I was able to talk to Lupita, her husband and son. Lupita’s husband made such an impact on my life. Seeing that he was in crutches made me wonder, and I asked him what had happened. As I was listening to his story, this brought many emotions back to me. He suffered from an injury as he was diving in the ocean. This was his job like many that support their families by fishing. This injury caused him to be paralyzed from this legs and he was not able to walk. It took him six years to get to where he is now using his crutches. As I was getting to know all the group that had come to this trip, I told them about a car accident I was in a year and a couple months ago. This car accident had happened in Mexico, and I had not been to Mexico or had been on a lengthy trip since then. Since I suffer from PTSD because of it, it caused a lot of anxiety. But I was not going to let my fears take advantage of me. From all the injuries I had, it took me a while to recuperate. Things just aren’t the same after a traumatic experience like that. This is why listening to Lupita’s husband’s story made me gain so much motivation. I can also say that I am grateful to be where I am at right now. It made realize even more that things can always be worse! Even though I experienced many snapshots in this trip, this is one story I could personally say really impacted me . The wonderful thing about ASB for me is the relationships created while on this trip. Just imagine 13 people from all walks of life, having different backgrounds, different life experiences and different ages. Sounds crazy, right? In most situations, having this many people may be hectic and chaotic, but this is not the case for this group. For some reason we got along very well. This day, the focus, at least for me, was on the relationships created on this trip, and the people that we met throughout the week. 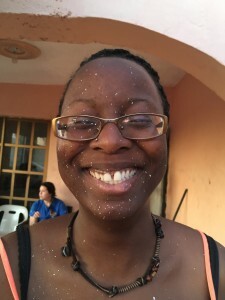 We had a chance today to “just be” with the people in Bahia De Kino. Most of us went to the markets and saw what they had to offer, but what made this part of the trip so powerful for me was witnessing the group come together … each of us looked like we had known each other for years. For each of us, the well-being of one another was really important. If someone needed help, there was always a hand, or five, available and willing to help and go out of their way. After the adventures through Bahia de Kino, we all collectively decided to hang out by the beach and just enjoyed each other’s company. It was AMAZING! I loved it. What also touched me about this day is in the afternoon when we went to Holy Thursday mass, the Washing of the Feet. I was excited to experience this mass in a different culture and to see the differences and similarities. What is so awesome about the Catholic Church is that if you have been to a mass a couple times, you somewhat know what is happening even if in a language you do not know! At this mass, I had the honor of being part of it. 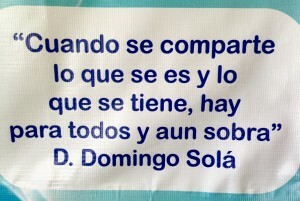 As we arrived at the church, we were approached by a gentleman talking in Spanish and I did not know what he wanted. 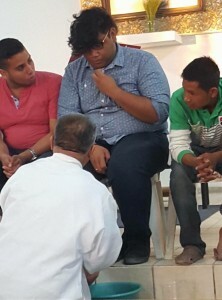 When someone translated, he was looking for another person to be part of the Washing of the Feet. Immediately I said yes, because this truly an honor. I was under the impression that I was only going up when it was time, but I and 11 others sat facing the whole congregation the entire mass. That was nerve-racking having everyone stare at you, but looking up I saw some familiar faces like Marisa from Familias Unidas, and the ladies we had served earlier in the week. This had me reflecting on the relationships we created on this trip, from remembering Maria and her love in Naco, to Ramon and his dedication to service in Guaymas, to all the people at Casa Fransicana. All these people had taught me me to humble myself, and to do everything with love and passion. After sitting in front of the congregation for some time, it was finally time to participate in Washing of the Feet. The priest made his way down the line washing our feet and conversing with each of us. In my mind, I was preparing to introduce myself in Spanish. When he came to me, he looked at my feet and, laughing, said “Tienes los pies de un elefante.” With my broken Spanish I pieced it together that he said I had feet like an elephant! That was so funny that it took me aback. Then he asked, “Como te llamas?” For you non-Spanish speakers, that means “What is your name?” I was still processing the comment he had made earlier, so I then answered with full confidence, “Tengo viente y uno anos” which translates to, “I am twenty-one years old.” The priest then looked at me confused and said ” Si, pero , como te llamas?” He said it slower stretching every syllable out . Then it hit me. So I then responded, “Mi nombre es Vince,” and he smiled and moved on. This little interaction with the priest really taught me not take life to seriously at times. Because he had this lighthearted spirit to him, it made everyone laugh and I really felt welcome at the church. That goes to show making relationship is the way to feel welcomed and be part of a community. After mass was dinner, but a couple of us needed to use the bathroom STAT. There was not a bathroom to be found. When we walked by the Red Cross station, I said lets go in and use the bathroom there. To our luck, they were fixing the bathroom. We stepped out desperate at this point but by the grace of God there was Marisa headed back from church. We yelled her name and got her attention. She then graciously let us into her home to use the bathroom. See, making these connections and relationships is really important. Without Marisa, I would still have a full bladder and without the priest I would not have this wonderful story to tell my grandchildren. I hold and cherish all the relationships I have created on this trip in my heart and at core of this is the universal language of love. Today we traveled from Bahia de Kino to Guaymas, it was a 3 hour drive. Upon arrival, we met Ramon and his wife at Casa Franciscana. 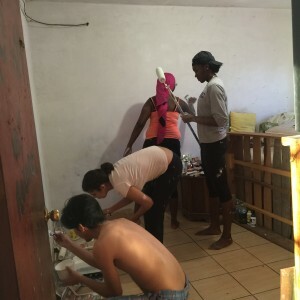 We started off by getting a tour of Casa Franciscana, then we broke up into groups and some of us were washing dishes, packing food, or helping serve. Casa Franciscana has many different programs that they have to offer for people who are in need. They offer free dental work, access to a pharmacy, and a medical clinic. The clinic and the dental area help with health care needs of those who need it. Many are migrants riding the train that comes up from the south. The train is known as “la bestia” or “the beast” because of what happens to the migrants who ride it. 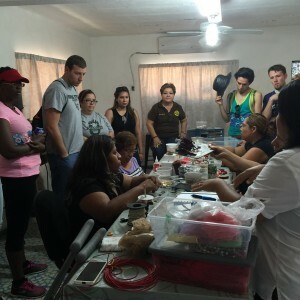 Casa Franciscana has a jewelry program just started one year ago. It is a program that was started for single and widowed mothers who need to find a way to provide income to their family, but at the same tiime take care of their children. This program is a three-year program where the women learn how to make jewelry with sea shells, how to work as a team with other women, leadership skills, and how to manage a business. They are usually making jewelry while their children are in school, but if they have children who aren’t in school, Casa Franciscana has an area for children to do activities while their mothers work. All the jewelry is sold there at Casa Franciscana, but it is only by donations And doesn’t have a specific price on it. El Meson is another part of Casa Franciscana and is a separate building where they serve breakfast, lunch, and dinner for anyone who comes in to eat. They serve around 1000 people daily. Some of us helped serve vegetable soup, tortillas, fruit, and lemonade during lunch time. Others were helping wash tons and tons of dishes, pots, and pans. And the rest of us were helping prepare food packages so those in need would have food for the rest of the week because it was going to be closed during Holy Week celebrations. Afterwards, we went with Gerardo, a Franciscan, to visit a trade school donated and built for people who want to get a diploma in cosmetology, computer technology, sewing, engish, etc. This school will be open on April 4 this year, and it will take in up to 25 students from the neighborhood who are interested in learning a trade. They will only have to pay 300 pesos every three months, but if they can’t pay, they won’t be turned away. After, Gerardo took us to Club Jerry, which is an after school program started by Father Jerry, who is from Canada. Club Jerry is a safe area for children to go after school and play basketball, rollerskate, skate board, or do their homework together. 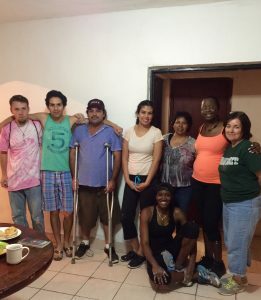 Visiting Guaymas was an amazing experience, we gained so much knowledge on all the services Casa Franciscana has to offer to those in need. It was a joy and honor to serve at Casa Franciscana and to meet such amazing people. It was great to be a part of the lives of everyone we met on this day, even if it was only for a few hours.